Comments: An anthology title reprinting Frank Miller's Marvel Daredevil US run plus a new Captain Britain strip from Alan Moore and Alan Davis, a continuation / restart of the Captain Britain run from Marvel Super-Heroes. Moore and Davis (who also collaborated on the Night Raven text stories in issues 6 to 11. 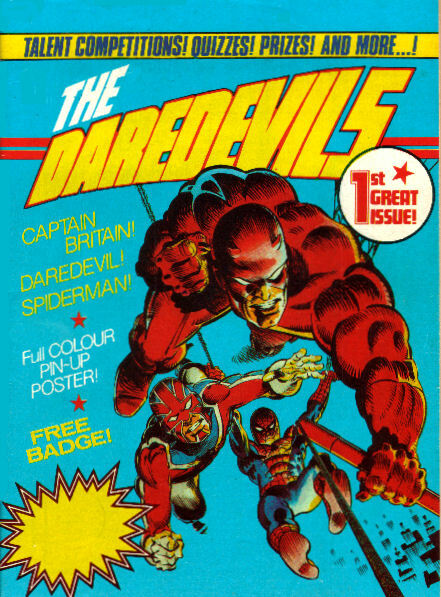 Mid-way through the run Moore brought the Special Executive, a team he had created for stories in Doctor Who Monthly, into the Captain Britain strip, and subsequent issues reprinted their earlier appearances; when those finished, Moore wrote the one-off Grit, a pastiche on Miller's Daredevil, and a few issues later Davis wrote and drew a Batman-parody, The Crusader.